Do you want to create a website for your association, business, club, company, organization or political party? Then you are at the right place where phpTransformer will do the whole job for you. 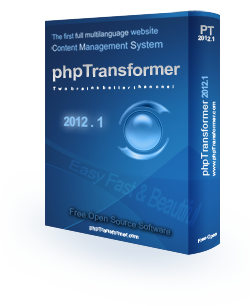 PhpTransformer will enable you to manage your website smoothly and easily, The basic features will help you tailor your website according to your business requirments, without the need for any programming skills, With phpTransformer wide range of tools you can add unlimited number of pages, create a news feed, run polls, reliable statistics system..and much more. Keep in mind that phpTransformer is the first content management software for Multilingual Internet sites, so if you have future plans to expand your website with more than one language, phpTransformer will offer you the solution then only the translation will be required. phpTransformer is a free open source program, free of cost and it will always remain so, in case you need any technical support for it, our team is fully prepared and ready to assist you. phpTransformer was created in 2006 and we still develop it on a daily basis to meet all your business requirements and aspects. We aim to provide you a software that you will be proud to use on your website on the Internet or within your internal network. Through technical support of your site, you will get the help and answers for each explanation, priority for new updates, and solving problems without waiting for the next version of phpTransformer. Create an entire site from scratch, domain registration, hosting and software. Send a report of problem you faced to help you..
Are you a programmer, designer or websites"s director and want to know the technical characteristics of phpTransformer and on what it"s different from other websites, and what he can help you in developing your abilities? A list of some sites that run on phpTransformer . Information on what"s new and changes in the last version of the program. phpTransformer more than one company, We are a team work, combine our energies to work freely and coordinate with each other and at the end we all win! We are a society share all it"s energies with love, support and help each other. Subscribe to RSS news summaries . Get answers to questions we receive frequently.